This antenna, I bought for the Balun for a different antenna project but when that project failed on initial testing, I decided to see what this antenna can do. 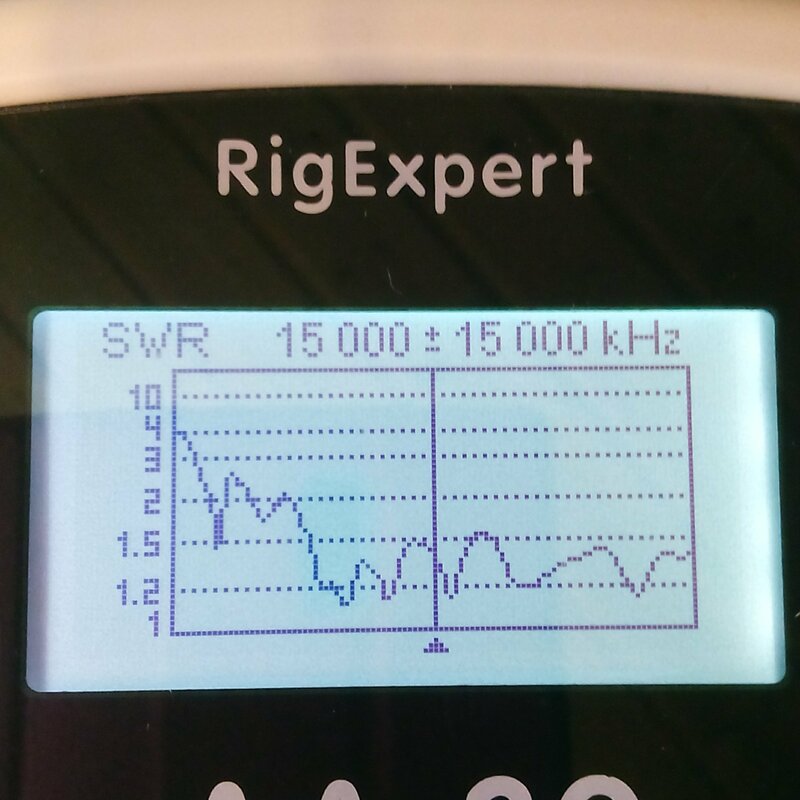 The claims are hard to believe – it’s supposed to be a Rx & Tx antenna covering 1.5MHz to 30MHz with an SWR under 2:1. The antenna design consists of that Balun (or UNUN?) which appears to have had its case screws super glued in place to make opening the unit difficult without destroying it and what looks like a dummy load resistor. There are two 1.5m lengths of wire and one 19.75m length. The resistor goes at the far end of the antenna one side to the antenna, the other side to earth. This is similar to what one might do on a Beverage receive only antenna. The feed end of the antenna gets the “Balun” – one side to the long wire, the other to earth via the 2nd. 1.5m wire and the SO-239 socket for the coax to the shack. The following is the information that I managed to find from various places on the web, about this antenna (mostly from Ads, so sorry for the “Chinglish”). HF20A is a great performance HF full band antenna and it features as high radiation efficiency and convenient installation, it offsets the NVIS Blind Area existed on other standard antennas.The communication distance will be 0-800KM if you use the HF20A antenna with a 25-50W HF radio with cable-stayed antenna installation, and the communication will be 0-1500KM if you use the antenna with a 125W HF radio with cable-stayed antenna installation.The directional communication distance will be further if you install the antenna horizontally. This antenna is described from abroad , this antenna abroad : ” widely used in military , water and so on use of emergency communications antenna concealment , easy to set up , no debugging , no need to tune day onCan work in the 1.5-30mhz whole paragraph 0 – 500 km without blind spots , the effective distance and inverted v antenna is quite within the range of 1000 kilometers and effective communication . ” As early as 2005 on the granting of Shenzhen has done a few friends use it, I am also using it has a years , is still very useful and convenient , especially for those who are unable to set up even inverted v friend , because it can be set up in various forms , can be horizontal , inverted v, triangle, box line , stayed out of the window and so on . outdoors erection when , more convenient , readily detected at the roadside to the tree branch over a length of 0.5 meters above the antenna propped up on it, the antenna location can not be straightened , no problem , let go Raowan antenna ‘s’ type is also Yes, one minute to get the antenna erection ! ! erection is a good helper for outdoor and radio stations set up special environment ! ! ! Recently, attention and love this antenna more people , and make a grant to a friend in need of it ! This antenna is very easy to set up , an individual can set up a good one minute , and the antenna is not required to debug , from 1.5 mhz – 30 mhz standing waves are very ideal height from the ground is also not strictly required, more than 0.5 meters above the ground can be worked , outdoor pedestal I also like to use it to make qso! ! On two words , easy ! Not exactly the claimed response, but not bad. Rough comparisons on 40m and 20m showed the antenna to be 20 dB down on my Sky Loop antenna which is physically somewhat higher. It did perform better than the loop on 80m and 160m however, which for a relatively short antenna is surprising. The comparative lengths of the wires attached to the balun do appear to affect the antenna’s operation. With a little maneuvering I managed to keep the antenna fairly high, moved it away from the house and still kept the short wire from the balun going to a common earth point. I’m glad to say, we are now back with a similar picture to my first installation. Of course the real trial will be in usage. Now at about 5 metres high at one end, sloping down to about 3.5m high at the other end, it is still lower than the skyloop at 8 – 8.5m high but the difference on 20 & 40m is now less pronounced. On receive at least this wide band antenna performs quite well. Transmit may be a different matter – especially with the power restriction. So far I have not found any advantage receiving “closer-in” stations. The way that I had the HF20A installed, it did not perform well and I took it down in early 2017. It is now back up in the air again in a different location in the garden. I started a project to extend my existing 40m Skyloop to cover 60m by adding an extra small loop into circuit. This required the existing 40m loop to be moved and two additional fiberglass masts to be added in the garden. This project (documented on this site) was not successful and I cancelled the idea of extending the loop. This left me with the two additional fiberglass poles available to install the HF20A end-fed random length wire antenna onto in a better location away from the house, than it had before. 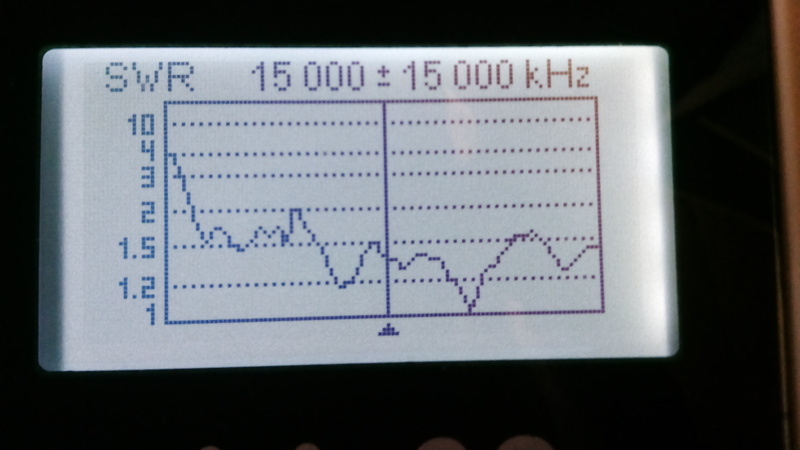 The HF20A seems to work quite well in its new location (signals generally are about -1.5 S-points down on the loop, so 6-9 dB rather than the previous 20 dB). I have one case on 20m where I received a station on the HF20A better than on the loop, so the fact that the HF20A is non-directional whereas the loop is, on multiples of its resonant frequency can be observed. 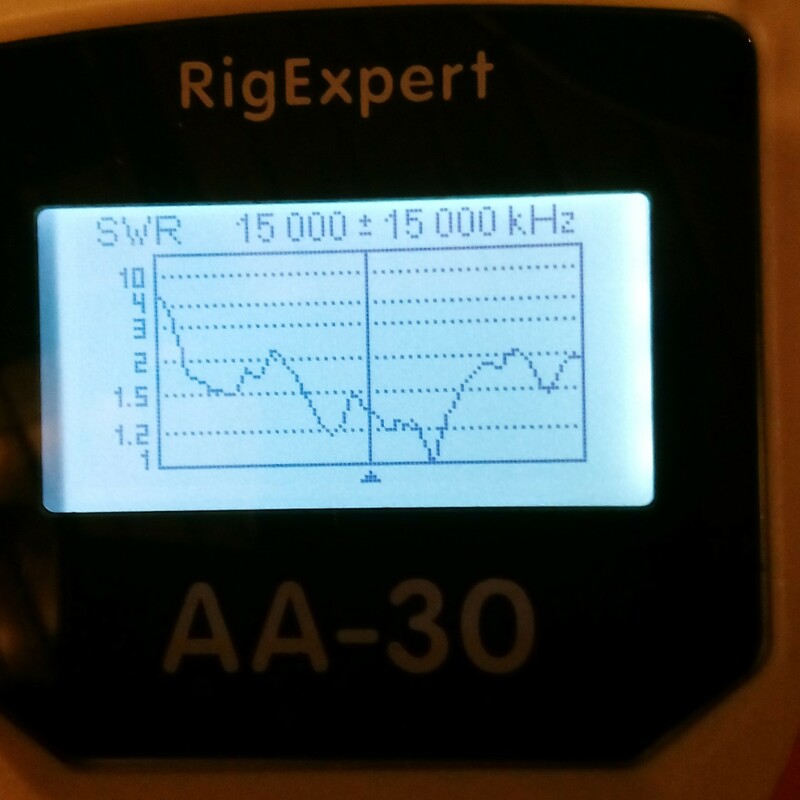 The HF20A also works on 60m without a bad VSWR reading. I have yet to make a contact on 60m with the antenna simply because the stations I have heard so far have been outside of the WRC15 band which is allocated for Germany. This will now become my 80m & 60m antenna until I find anything better. One point of note – it appears extending the earth wire from the resistor at the far end has no effect on the operation of the antenna as I have the resistor at the top of the far 7 metre high fiberglass pole and use then a 7m wire to go down to an earth stake (actually a metal post that supports a wooden fence).